Throughout her life, Maureen dedicated herself to others. 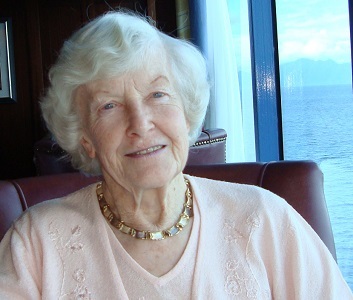 She met her husband George when they were both at Edinburgh University and in 1952 the newly-married couple immigrated to Canada. Maureen worked as a social worker in Edinburgh and then in Montreal. She moved with George to Deep River and in 1970 to Kingston, where she became a well-loved student and study skills counselor at the Ban Righ Centre, where 'Maureen's Room' continues to welcome students today. She continued to help others after retirement. In memory of Maureen, please make a donation to the Maureen Ewan Ban Righ Foundation Endowment Fund, which was established by Maureen and George Ewan. The Maureen Ewan BRF Endowment Fund was established to provide support for general operation of the Ban Righ Centre. Please be sure to fill out the commemorative portion of the giving form entitled "Dedicate my gift to Maureen Ewan". This will allow Queen's to notify her family of your thoughtful donation to the Maureen Ewan Ban Righ Foundation Endowment Fund.